Tania Bruguera is one of the leading political and performance artists of her generation. Her work researches ways in which art can be applied to everyday political life; she seeks to create a public forum to debate ideas shown in their state of contradictions and to focus on the transformation of the condition of “viewer” into one of “citizenry.” Bruguera uses the terms “arte de conducta” (conduct/behavior art) and “arte útil” (useful art) to define her practice. She works on appropriating the resources of power to create power, and on creating political situations through art. Bruguera has been a participant in Documenta 11 in Germany as well as in the biennials of Venice, Johannesburg, Sao Paolo, Shanghai, Havana and Site Santa Fe. Her work has also been exhibited at the New Museum in New York; Museum of Contemporary Art Chicago; Boijmans Van Beuningen Museum (The Netherlands); Museum für Moderne Kunst (Germany); Helsinki Art Museum (Finland); Whitechapel Gallery (England); Centro de Arte Contemporáneo Wifredo Lam (Cuba); and Museo Nacional de Bellas Artes (Cuba). She has performed at the Kunsthalle Wien (Austria); Stedelijk Museum voor Actuele Kunst (Belgium); Museo Ex Teresa Arte Actual (Mexico); Museo de Bellas Artes (Venezuela); and the Institute of International Visual Arts (England), among others. Bruguera has lectured extensively at such venues as The New School in New York, the School of the Art Institute of Chicago, the Royal College of Art in London and The Museum of Modern Art in New York. In 1998 she was selected as a Guggenheim Fellow, and in 2000 she received the Prince Claus Prize from The Netherlands. 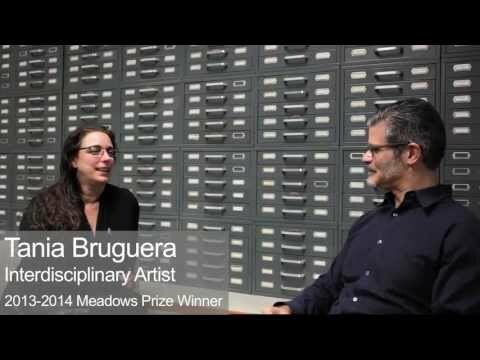 Her work is part of the collection of The Museum of Modern Art, artists’ books collection; Bronx Museum of the Arts; JP Morgan Chase Bank; Museum für Moderne Kunst (Germany); Daros Foundation (Switzerland); Museo Nacional de Bellas Artes and Centro de Arte Contemporáneo Wifredo Lam (Cuba); and the University of Essex Collection of Latin American Art (England). She was an artist-in-residence at the Skowhegan School of Painting and Sculpture; San Francisco Art Institute; Headlands Center for the Arts; ART/OMI International Workshop; Khoj artists’ residency (India); Western Front (Canada); and Gasworks (England). Bruguera is a graduate of the M.F.A. program at the School of the Art Institute of Chicago and of the Instituto Superior de Arte in Havana, Cuba, where she founded and directed Arte de Conducta, the first political art studies program in the world. Currently she is a visiting faculty member at the Ecole des Beaux-Arts in Paris, the IUAV in Venice and the Rijksakademie in Amsterdam.